Fashion accessories are an important aspect of every man’s outfit, yet quite often they do not get the recognition they deserve. 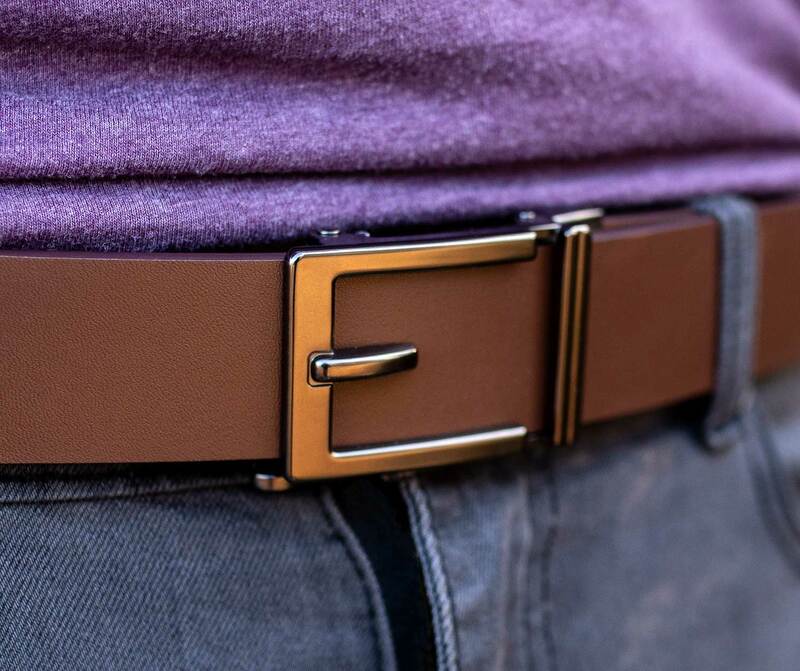 Belts are one such item which holds the key to style and functionality in equal measure, with this in mind let us take a closer look at the Kore Essentials Track Belt in my latest review. 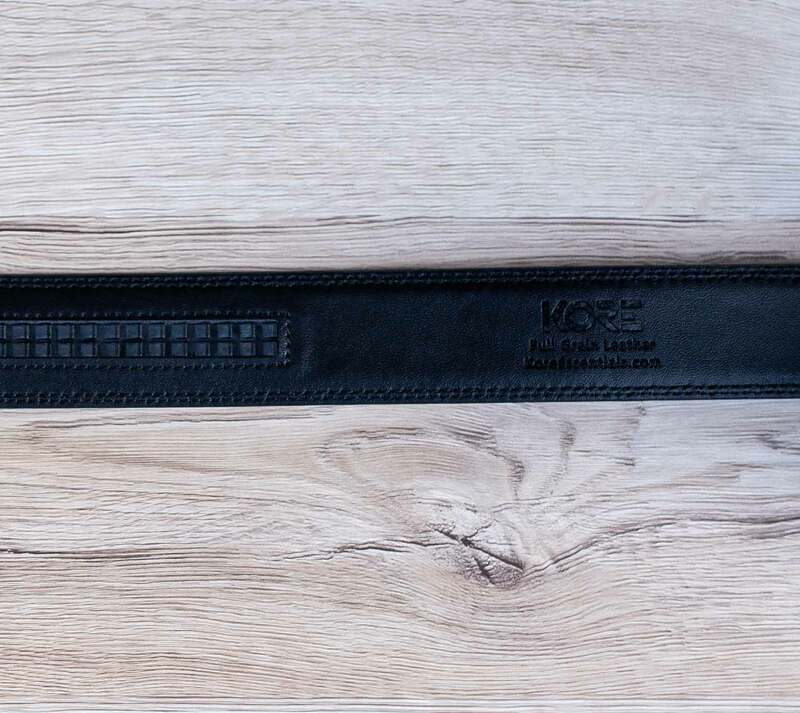 Kore Essentials have created their whole brand around a very unique characteristic, namely the hidden track feature on the reverse of all of their belts. 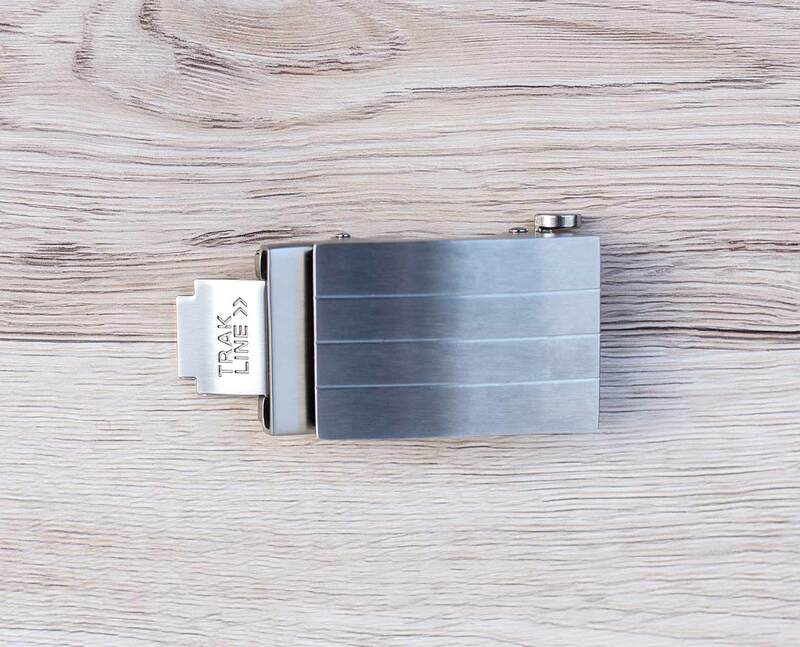 The idea behind this novel addition is that you no longer require a belt with holes, boasting over 40 size points for small incremental size changes. Does this invention call for the end of belt holes? Read on to find out! 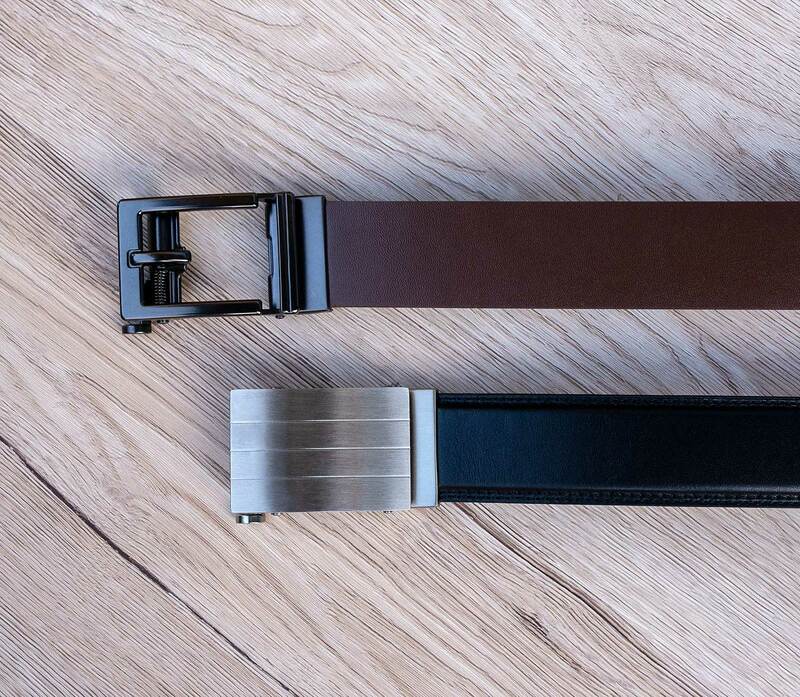 For the purpose of the review, I chose the Evolve Buckle & Belt Set, comprising of a stainless steel square buckle featuring a horizontal lined pattern effect and including a dark brown belt. My second choice was the Express Gunmetal Buckle & Belt Set (with solid black belt), opting for a traditional belt buckle design, however, its shape is just a design aesthetic with no moving parts. Both of the belts are constructed from a high-quality full-grain leather. Both purchases offer timeless classic designs, looking sleek and smart, equally at home with jeans or even a three-piece suit. When it comes to usability, the Kore Track belts really shine. 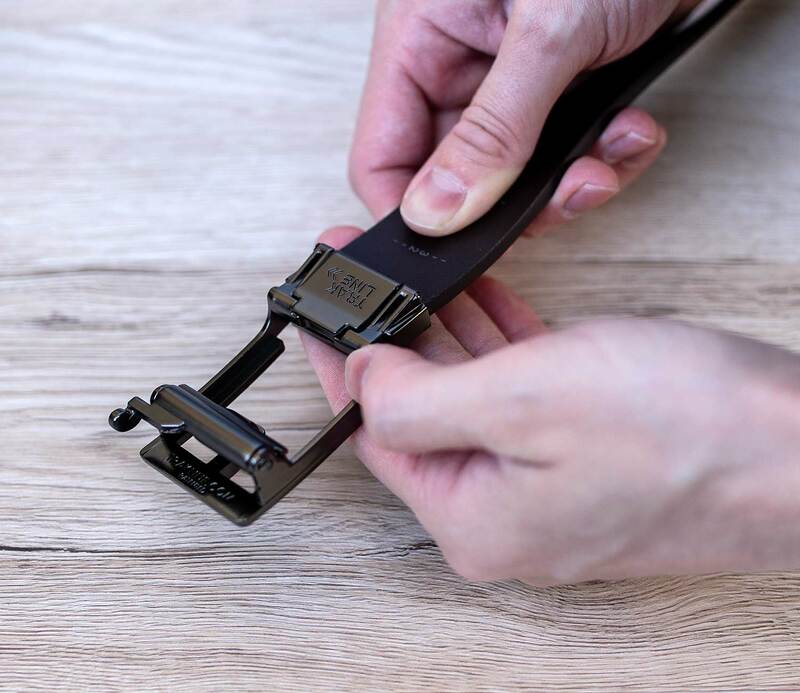 Dismiss your previous ideas of how a belt should work, tirelessly threading the buckle prong through the holes, wearing down the leather during each wear. With this belt, you slide the end of the belt through the buckle and it instantly connects to the track, you will hear a satisfying whirring noise as the opposite ends of the belt work together as you pull it tighter. To undo, you simply press the tab hidden beneath the buckle and pull the end of the belt back through. When you receive your parcel, the belts are an unfinished long size, fitting waist sizes from a 24 inch all the way up to a 44 inch. 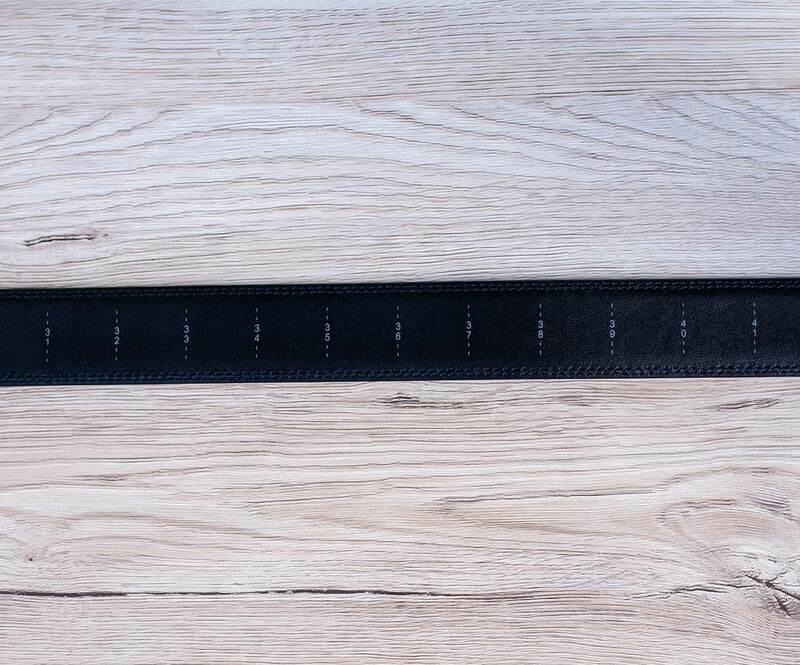 In order to trim the belt to your correct size, Kore has made it a very simple process, thankfully printing the full range of measurements on the reverse. It is recommended to cut the leather 4 inches higher than your actual size – for example, if you are a 30 waist then make the cut at 34 inches. 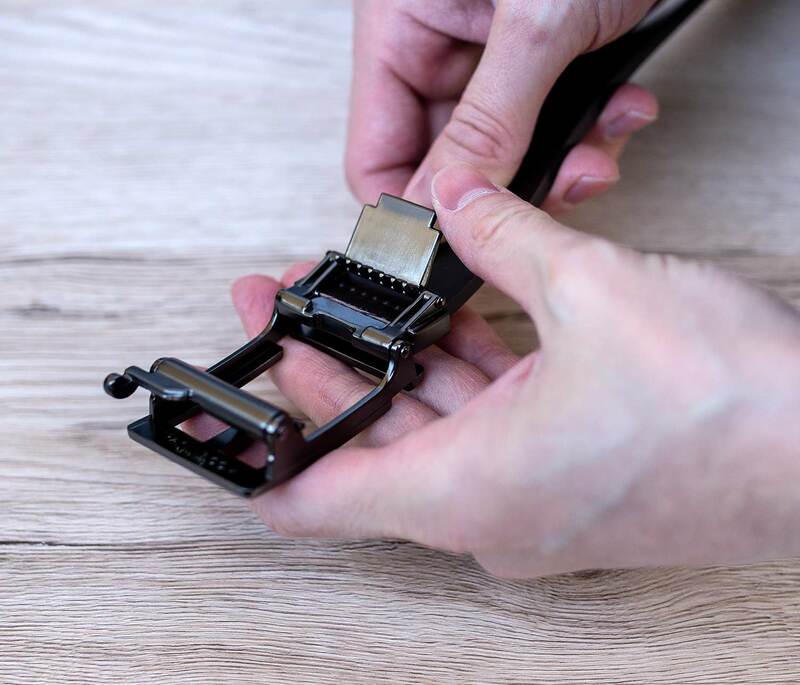 Once cut, you can then attach the buckle by threading the newly cut end through the hole in the metal, pressing it firmly against the flat edge and press the spiked section firmly into the leather, locking it shut. Once complete, you can slip on your belt and enjoy! It is worth noting that is it best to cut the belt larger, rather than smaller if you are unsure, you can always remove extra afterwards. 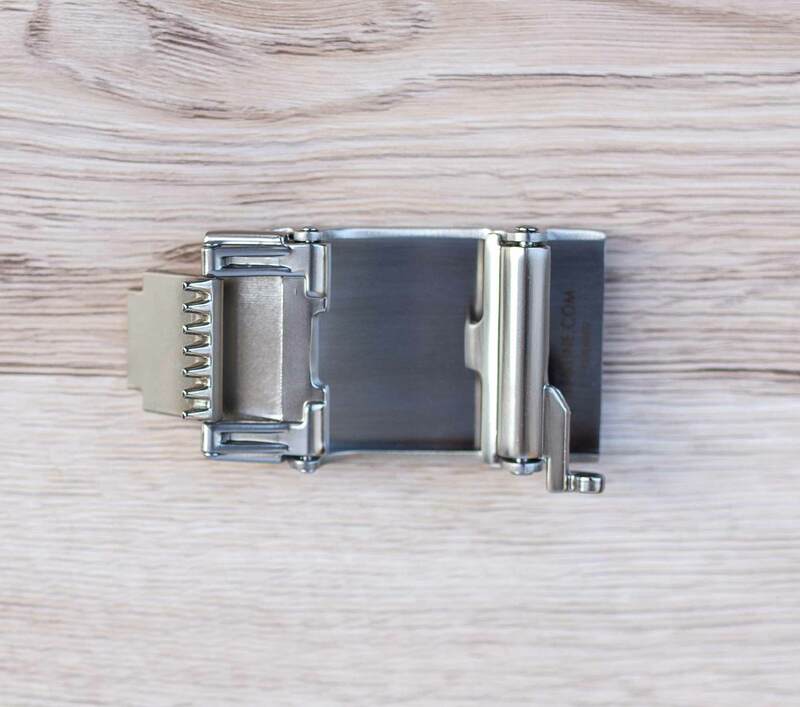 If you need to swap over different buckles, you need to prise over the spiked part and detach it, then just reattach the other buckle. As stated earlier in the review, these belts can be paired with a variety of different outfits. Worn casual with a pair of skinny jeans and a T-Shirt or for a smart look with a three-piece suit at the office. One of my personal favourite looks would be to pair it with Stylish Boda Skins Leather Jacket For Men Outfit for a cool biker style! Their simple yet effective designs will ensure they can be worn day in and day out. In terms of comfort, there are definitely no complaints to report, with the ability to minutely adjust the sizing on the fly, you will never encounter that too loose or too tight scenario (no need to worry about discomfort after a big lunch!). The cost of belts can vary dramatically, some are priced at only a few pounds, whilst others can run into hundreds! The Kore Track Belts come in at a reasonable price point, which avoids hitting the bank balance too badly! When you take into consideration that the leather is less prone to regular damage because of the lack of holes, increasing its lifespan and massively reducing the number of replacement belts you will need in the future. In summary, I highly recommend the Kore Track Belts, they state that once you have tried one of their belts, you will never want to go back to a traditional style belt. After giving these a test drive, I can fully agree with their statement! Beautifully designed, brilliant functionality and available at an excellent price. If you are in the market for a new belt, then you should take a look at the Kore Essentials brand. Additionally, I am happy to offer an exclusive 10% discount to my readers – use code AverageGuyStyle10 at the checkout! What do you think of my latest men’s fashion blog review? Does this type of men’s accessory interest you? Please let me know in the comments below! Awesome, hands down the best belts. Does what it says, clicks. I replaced all my “belts with holes” to these Kore belts and could not be happier. Hi Chadwick, yes, they are undoubtedly pretty amazing belts! Kore makes such a great quality product. I’ll never wear a belt with holes in it again !! Guys, if you’re looking for a belt, Kore makes the BEST belt ever hands down. I love it. It has a simple track on the back of the belt that you can’t see, with notches that lets you adjust in small amounts. So move the size in or out til you get a precise fit. I bought my belts directly from Kore Essentials online http://www.koreessentials.com I now own a total of 3 of their mens belts in different colors and buckle styles. Its way better than my leather belts with holes, that are always either too loose or too tight. But I don’t wear those belts anymore they sit in the closet. With this Kore belt if I eat too much for lunch I can let it out ¼” at a time or take it in the same. My waist is always fluctuating. Sounds crazy but its one of my cherished possessions. Most of my sons wear these belts too and I recommend them to everyone. I will never buy any other belt. Thanks Jeffrey, it is a great addition to any wardrobe for sure!